Reading books on portable devices is nothing new — people figured out how to load text copies of public-domain works onto now-antiquated devices like Palm Pilots and early monochrome iPods years ago. But smartphones have turned out to be excellent e-readers and benefit from the fact that people tend to take their phones with them wherever they go these days. Depending on what you want to read, you may not even need any money because the books are free. All you need is an app and some time. But which apps, and which apps work on which phone platforms? If you’re looking for a reader that comes connected to its own online bookstore full of premium books – best-sellers, new titles, stuff written after 1923 — Amazon’s Kindle app works on just about every mobile platform: Android, iOS, Windows Phone, BlackBerry, plus you can read the same books through your PC, Mac or Kindle hardware e-reader. And being Amazon, you have thousands of books to browse and buy there, as well as free titles to peruse. Sony has a Reader app for Android, iOS, PC and Mac reading and Barnes & Noble has a mobile Nook app for Android and iOS to buy and download books from its online bookstore. While there’s no Nook App for the Windows phone platform, there’s one for Windows 8 and Windows RT. Nook also has freebies. Google Play Books has an Android app and one for iOS, and books from the Google shelves can also be read on devices with Web browsers and certain e-readers, including the Windows Phone. Google Play Books has its share of free titles as well. 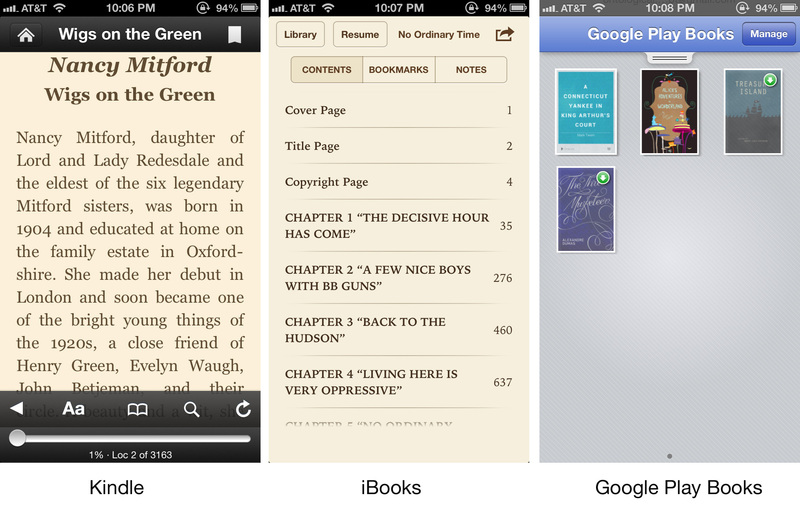 Apple’s iBooks app — with its connection to Apple’s iBookstore —works on iOS. The iBookstore has its own free books — just tap the Top Charts button or any of the categories to see a list of the popular freebies. If you like a social network with your reading, Goodreads has apps for Android and iOS, and Kobo has apps for Android, iOS, Windows and Mac as well (and BlackBerry). You can find Kobo free books here and Goodreads free books here. Want to borrow an e-book from a participating library? Check out the OverDrive Media Console app (available for Android, iOS, Windows Phone and BlackBerry). With the right software and space on your phone, you can fit a whole shelf full of books in less physical space that a cheesy airport paperback takes up in your bag. And when you read on your smartphone, no one can really tell what you’re reading, so you can read the e-version of that cheesy airport paperback in peace.